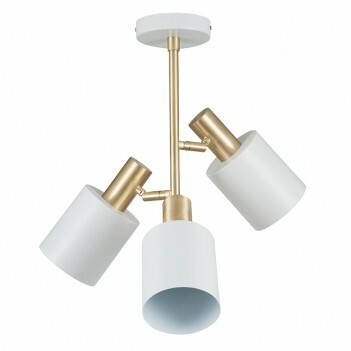 This is a retro style 3 bulb white and gold ceiling light. The manufacturuer recommends that each bulb takes a max of 12W energy saving bulb, we've displayed ours with 5 W LED candle style bulbs that are dimmable. Each of the shades are adjustable as shown in the photos. The shades are made of metal and the gold has a brushed finish.